While Haiti’s failure is reaching a peak, the international community’s behavior needs to change to allow Haitians to turn things around themselves. “Here we go again in #Haiti. Another messy morning in #PAP where getting gas has become a matter of who you know because pumps are only delivering on a privilege basis. This station at Bois-Patate says it’s only giving diesel to intl organizations”. This tweet from Miami Herald’s Caribbean correspondent, Jacqueline Charles, on April 2, 2019, captures the mood of what Haitians face on a daily basis.. And not just for fuel. 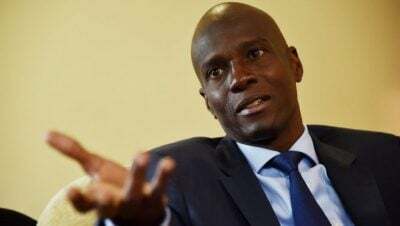 In June 2017, President Jovenel Moise made a big promise: “I give myself between 18 and 24 months for Haiti to have (24-7) electricity’’, he said. Twenty-ninemonths later, most parts of Haiti are still facing daily blackouts. Some of them can last up to eight days. What’s behind Haiti’s gas shortage and power blackout? Try $ 80 million in unpaid bills, the Miami Herald revealed on January 18th. But the Haitian government has never explained the real cause of the recurring fuel shortages that, among other things are contributing to the blackouts. As for the newspaper article, unfortunately only few Haitians will understand it because most of them don’t read or understand English, if they can read at all. Those who do understand had better not complain on Twitter. You might find yourself slapped with a summons to appear before the Port-au-Prince chief prosecutor to explain yourself. That is what happened to Maarten Boute when he let his frustrations out on Twitter in January during a month long fuel shortage. Boute is the Haiti Chairman and CEO of Digicel, a multinational telecom company and one of the government’s biggest tax payers. The specter of chaos has been hovering over Haiti for several decades. However, the country’s current situation has never been so difficult in the last 30 years. “Even the coup period of ’91 doesn’t compare with this anarchy Paul Denis, a former Haiti justice minister said. “Fear lies in the heart all of all citizens. Armed groups impose their law in every corner of the country. Legitimate authorities have lost the monopoly of force for the benefit of bandits”, he asserts. Even diplomats are not immune. On March 28th, as he visited a program financed by his government, Chile’s ambassador to Haiti, Patricio Utreras Díaz, accompanied by his wife and a Chilean delegation, were attacked by five heavily armed men. Their visit to Boutin, a village in Croix-des-Bouquets on the west side of the capital, “was brutally interrupted around 11:30 am when 5 individuals armed with AK-47s attacked and opened fire on the procession of the Embassy of Chile (about 18 people) leaving many bullet impacts on their vehicles,“ reported Haiti Libre, an online publication. Although the Embassy’s security agents responded and managed to regain control, ‘’a Haitian volunteer from the NGO “América Solidaria,” Frantz Eliancin, died while the ambassador’s driver was shot in the wrist’’. This attack on a diplomatic convoy was a first for Haiti and showed the degradation of criminal acts in the country. Samuel Madistin, a lawyer who serves as Chairman of the Borad of the human rights group, Fondation Je Klere (FJKL) describes the current situation as ‘’unprecedented’’. “The state is totally absent and the citizens are left to fend for themselves, while neighborhoods around the capital are controlled and led by gang leaders. We are in an explosive situation that can lead to any disaster at any time,’’ he says. Madistin and Denis’ warnings come as the latest U.N. peacekeeping mission prepares to come to a close.Can a volatile Haiti, which has seen over 200 demonstrations since December — including 10 days of violence in February — finally take responsibility for its own security?, Jacqueline Charles of the Miami Herald asks in her latest piece. ‘’It’s the duty of any state to ensure the security of its territory and the protection of its citizens,” Madistin responds. For the human rights lawyer, the international community has contributed to the security degradation of the country. ‘’It did not help us. On the contrary, it wasted millions of dollars for nothing by participating in a so-called stabilization of the country, which in fact, put Haiti in this total failure,” he says. Haiti National Police Director Michel-Ange Gédéon says he has confidence in the training of officers to take over once U.N. forces leave the island nation. Butseveral police officers have been killed these past months, including at least two were burned alive. In an interview with the Miami Herald, Gédéon concedes that‘’there are weaknesses, from the need for more vehicles and firepower to the lack of logistics capabilities.’’In addition, protecting human rights remains a serious issue. Not for Haitians but also for members of the US Congress. Last month, 104 members of Congress sent a bipartisan letter to U.S. Secretary of State Mike Pompeo expressing concerns that police used excessive force against protesters during the recent civil disturbances. That letter was triggered by the recent human rights allegations about extrajudicial killings in the community of La Saline in November 2018 and the Haitian government’s overall lack of accountability. Human rights groups in Haiti have reported that as many as 71 individuals were killed, while women and girls were raped and houses looted. Haiti is just not in the throes of a political crisis, but an economic crisis as well. The Gourde, Haiti’s national currency, has been falling drastically for the past seven years. Under the administration of former President Michel martelly and his PHTK political party, this devaluation got even worse. Haiti’s current president, Moise, was hand-picked by Martelly to be his successor. He describes himself as a businessman, but has never held political office or worked in government prior to assuming the presidency in 2017. For the past two years, “Moise has been widely criticized by politicians and citizens alike for failing to publicly respond to the demands of the people. He has also been vilified for his government’s lack of transparency and its ineffectiveness,” writes Sandra Lemaire of the Voice of America. Haiti’s Institute of Statistics and Informatics (IHSI) says the country’s unemployment rate is 45.6 percent. Others put it much higher. Either way, it’s safe to say that at least half of the Haitian population does not work and most jobs are in the informal sector. It is also widely known that the PHTK party, which remains in power under Moise, has little use for qualified professionals who do not share their political views. The disregard for university graduatse could be seen in former president Martelly’s own words – a now famous tirade from his days on the presidential campaign. ‘’Plomas, plomas plomas, what’s the deal with these diplomas?’’. Martelly himself has no diploma. In the 2011 elections, he asked the Haitian people to reject Mirlande Manigat, a highly recognized intellectual and university professor, and to choose” between a 30-year old system’’ and the change he represented. Meanwhile, Martelly said he symbolized “honesty”. Questions about the characterization of his own character and tenure has been crystallized through what is believed to be the biggest embezzlement in the history of Haiti: the PetroCaribe fund. Haiti’s Superior Court of Auditors has detailed cited disastrous management practices and the suspected diversion of nearly $2 billion (€1.7 billion) from the fund, which is part of an oil alliance Haiti has with Venezuela. A report published by the auditors has added fuel to the PetroCaribe Challenge, a grassroots movement against widespread corruption in Haiti that began on social media and now has spread to all corners of Haiti. Indeed, Martelly represented so much honesty that Haiti today is ranked 161 out of 180 countries on Transparency International’s Corruption Perceptions Index. Indifference. Disdain. This is how the current and past PHTK’s administrations treat the Haitian people. Haiti has become the land of their so-called, ‘’legal bandits;’’ A land to flee from by any means necessary. This week, at least 15 Haitians died while in search of a better life when their boat capsized off the Turk and Caicos islands. Not a word or a tweet from Moise after the tragedy. ‘’In just over a month, a total of 43 compatriots have died at sea fleeing misery, aggravated by the failure of governance and the disastrous economic and financial record of the man of the banana’’, wrote the Nouvelliste, Haiti’s oldest daily newspaper, referring to the president. “Haitians die because your administration does not rule, President Moise’’, titled the day’s editorial. Ironically, the same day Duval’s editorial ran, the US Embassy in Port-au-Prince was announcing the first visit of the Deputy Assistant Secretary for Haiti, Canada, and the Caribbean, Cindy Kierscht. Her mission? To “highlight how the United States and Haiti (can) work together toward a more safe, secure, and prosperous Haiti”. Haitians on Twitter thought it was a joke; an April Fools’ Day prank. It was not. Why support such a regime as PHTK? Why would the United States support a president as despised and incompetent as Jovenel Moise? How much more suffering will the Haitians have to endure for the international community to come to its senses? It is clear that the countrywill not survive three more years of this misery. In the meantime, the UN Security Council met in New York on Wednesday, April 3, 2019 to discuss the end of the United Nations Mission for the Support of Justice in Haiti (MINUJUSTH). While the interventions of the other members of the Council only recounted the missteps of the current administration, the United States of America was practically the only country in this meeting to claim that everything is going well in Haiti. ‘’Nations like Haiti don’t ‘fail’ because of their people, but because they’ve been relentlessly exploited by the more ‘developed’ world,’ ’Amy Wilentz, an American journalist and writer, wrote three years ago in The Nation. She made the following point: ‘’Haiti’s ongoing crisis is the product of global forces, and only huge, unlikely changes in international behaviors—especially on the part of the biggest, most abusive nations and organizations—will allow the Haitians themselves to turn things around”. When will the international community understand that? Nancy Roc is an independent Canadian journalist with over 30 years of experience. Originally from Haiti, she is specialized in political analysis and her work has been published in many Canadian newspapers, such as La Presse de Montreal, Le Devoir, Jobboom, Le Soleil or L’Actualité magazine; as well as on websites, such as, l’Observatoire des Ameriques, Gaiapresse.org and Alterpresse.org She has also collaborated numerous times as a political analyst with Radio Canada and CBC News Canada. Her other research topics’ specializations are the environment, climate change, violence against women, women’s empowering and autonomy. Loop Haïti: En 30 ans, Haïti n’a jamais eu une crise aussi aiguë, selon Paul Denis, March 15th, 2019. Haiti Libre, Haiti – FLASH: The procession of the Embassy of Chile attacked with weapon of war, January 28th 2019. Jacqueline Charles, U.N. is set to end peacekeeping in Haiti. Can the country’s police force do the job?,Miami Herald. April 2, 2019. Sandra Lemaire, Haitian President to People: ‘I Hear You’, February 15th, 2019. Haiti Libre – Haïti – Élections : Premier débat Manigat – Martelly, March 9th 2011. Frantz Duval, Des Haïtiens meurent parce que votre administration ne gouverne pas, président Moïse, Le Nouvelliste, April 1st, 2019.